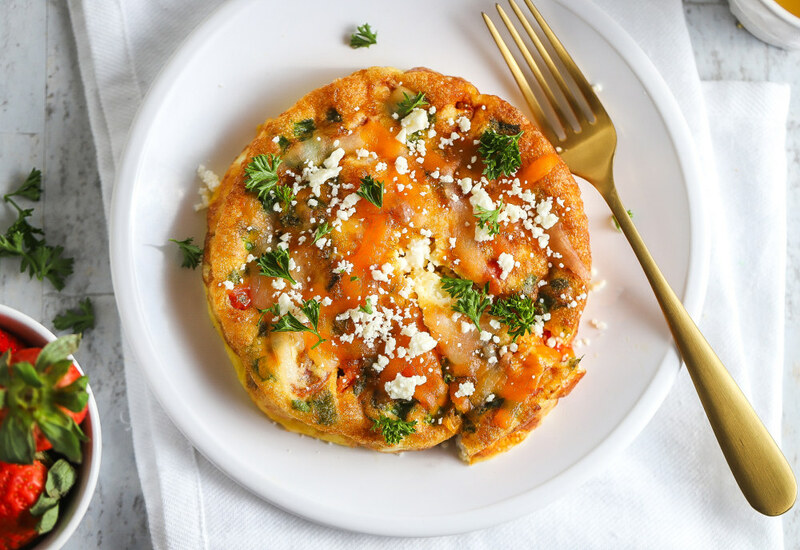 The frittata, an egg-based dish filled with veggies and cheese in this recipe, is a great main dish at brunch or breakfast. Made in the air fryer, this frittata is ready in about 25 minutes. You can throw together a crowd-pleasing gourmet brunch with ingredients you might already have on hand. Pop out the mimosas and serve a light green salad and you have a complete meal. Try other vegetables in place of the spinach, onion, and tomato, such as broccoli, garlic, or asparagus. Per Serving: 361 calories; 22g fat; 17.4g carbohydrates; 26g protein; 413mg cholesterol; 1083mg sodium.